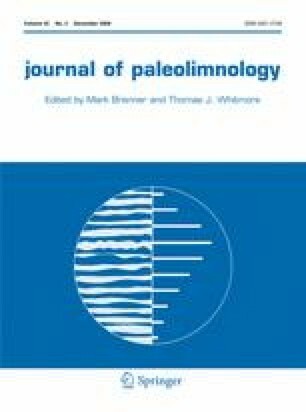 A 6,500-year diatom stratigraphy has been used to infer hydrochemical changes in Lake Awassa, a topographically closed oligosaline lake in the Ethiopian Rift Valley. Conductivity was high from ~6400-6200 BP, and from 5200-4000 BP, with two brief episodes of lower conductivity during the latter period. Although the timing of the conductivity changes is similar to the timing of lake-level change in the nearby Zwai-Shalla basin, their directions are the reverse of that expected from a climatic cause. Dissolution of the tephras which precede both phases of high conductivity cannot explain the increases in salinity, because rhyolitic tephras are only sparingly soluble. Instead, the pulsed input of groundwater made saline by the reaction of silicate minerals and volcanic glass with carbonic acid, formed from the solution of carbon dioxide degassed from magma under the Awassa Caldera, is suggested as a plausible mechanism for the observed change in lake chemistry. Diatom-inferred hydrochemistry cannot therefore be used to reconstruct climate change in Lake Awassa.